The location was on Pennsylvania Avenue near the Capitol Building. The "Take It!" was yet another one of those views while sitting waiting for a traffic light to change from red to green and have me once again on my way. I have to admit - that I have to remain vigilant for it is during times like this - there is every temptation to "zone out" and come back to functioning when the light turns to green. 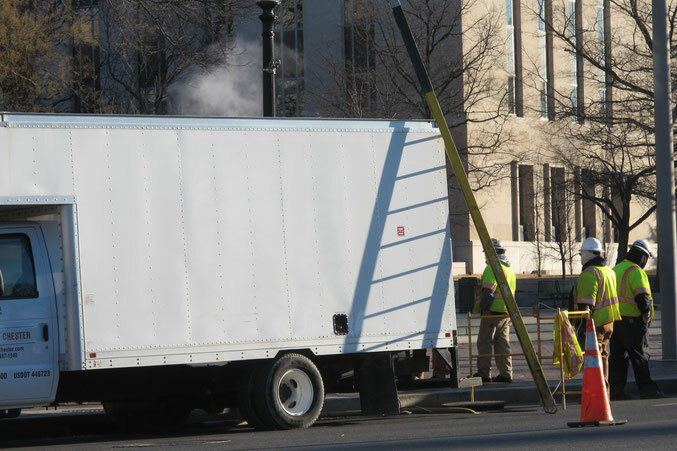 So, when I happened to look to my left and see the shadow of the ladder on the side of the truck - I had to move fast to dig out my camera and take the shot. The After Take: And this one was truly a figure out later what to do with it after trying to determine what was going on. In this instance the crew of yellow vested workers was preparing to descend into a manhole that apparently was deep enough that they needed a ladder of this length to get down to the subject that needed attention. The sun was at just the right place to cast this great shadow calling attention to this interim step in preparing to " Get down to Business "
I think this is a candidate for the chapter having to do with "The journey and the destination." Another thought that comes to mind - having enormous respect for the work that these folks do in keeping everything running. Sometimes being called upon to make repairs or installations in absolutely the worst of conditions. I have been giving more breaks when I can to trucks that are out there about the business of keeping all of this thing called, where we live, up and running. That support structure would have made me very nervous. Its just propped up on the side of the truck. I have been down a few manholes in my day. I don't envy their job! I wouldn't be caught dead down there. The shadow on the side of the truck looks pretty cool the angle of the sun makes it look a lot bigger than the actual ladder. The things we do to make a living. It takes a village!